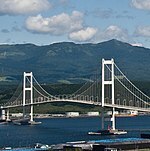 The world's longest suspension bridges are listed according to the length of their main span (i.e. the length of suspended roadway between the bridge's towers). 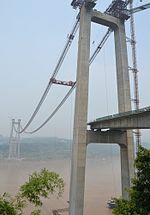 The length of main span is the most common method of comparing the sizes of suspension bridges, often correlating with the height of the towers and the engineering complexity involved in designing and constructing the bridge. If one bridge has a longer span than another it does not necessarily mean that the bridge is longer from shore to shore (or from abutment to abutment). Strait of Messina Bridge Sicily to mainland Italy 3,300 m (10,800 ft) Cancelled The project was cancelled on 11 October 2006 by the Romano Prodi-led government amid controversy concerning the bridge's cost. The new government from 2008 led by Silvio Berlusconi wanted to pick up the project again. Preliminary works were to begin in December 2009. The main construction was expected to begin in 2012. As of February 2013, the project has again been cancelled. 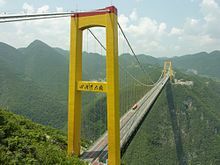 Mao Zedong Bridge Qiongzhou Strait, China about 2,000 m (6,600 ft) Preliminary work A suspension bridge is being considered to cross the 22.5-kilometre-wide (14.0 mi) Qiongzhou Strait. One design consists of four bridges strung together with four main spans of 2,000 m, two main-spans of 1,800 m, five anchorages and 10 towers. If completed this bridge will assume six of the top seven longest spans. Great Suspension Bridge Fribourg, Switzerland 271 m (889 ft) 1834–1849 The bridge was replaced by the Zähringen Bridge [ de] in the 1920s. Tacoma Narrows Bridges ( Washington, U.S.), 1950 and 2007. The pair of bridges with the longest spans in the world (853 m [2,799 ft]). Yavuz Sultan Selim Bridge ( Turkey), 2016. The longest span carrying road and rail traffic (1,408 m [4,619 ft]). Tsing Ma Bridge ( Hong Kong), 1997. The longest double deck span (1,377 m [4,518 ft]). George Washington Bridge ( New York and New Jersey, U.S.), 1931. Suspension bridge with the most lanes of traffic (fourteen total on two levels). ^ Duan, Lian (2014). "Longest Bridges and Bridge Spans". In Chen, Wai-Fah; Duan, Lian (eds.). Handbook of International Bridge Engineering. Boca Raton, Florida: CRC Press. p. 1307. ISBN 978-1-4398-1029-3. Retrieved 3 February 2015 – via google books. The total length often reflects a project size, while the span length commonly correlates with the engineering complexity involved in designing and constructing of the bridge. ^ a b "New mega bridge to speed up China's Greater Bay Area - Global Times". globaltimes.cn. Retrieved 3 April 2019. ^ "Facts and history". Storebælt. Archived from the original on 23 July 2018. Retrieved 23 August 2018. ^ "雅康高速全线开通首日 40余辆车违停拍摄兴康特大桥美景被驱离". new.qq.com. Retrieved 3 February 2019. ^ "万利高速公路建成通车-新华网". xinhuanet.com. Retrieved 1 January 2018. ^ "Wanzhou Fuma Yangtze River Bridge - HighestBridges.com". highestbridges.com. Retrieved 1 January 2018. ^ Sakowski, Eric. "Siduhe River Bridge". HighestBridges.com. Archived from the original ( Wiki) on 2 March 2012. ^ "金东大桥建成通车 四川到云南更加方便- 成都本地宝". cd.bendibao.com. Retrieved 12 December 2018. ^ Rangongo, Timothy (14 November 2018). "For R40 you can drive across Africa's longest bridge – and get to Mozambique four hours faster". BusinessInsider. Retrieved 12 December 2018. ^ "利好！总投资230亿！建宁西路过江通道、仙新路过江通道开工|界面新闻". jiemian.com (in Chinese). Retrieved 31 March 2019. ^ "四川叙古高速公路赤水河特大桥开工 古蔺叙永出省更方便_川南经济网". chuannane.com. Retrieved 6 December 2017. ^ "Presentation Memo: Suspended bridge suspended over the Danube in the Brăila area". anpm.ro. Retrieved 21 March 2019. ^ "亚洲同类型主跨第二大桥梁——瓮开高速开洲湖特大桥开工_桥隧资讯_交通界". jiaotongjie.com. Retrieved 31 March 2019. ^ "五峰山长江大桥简介_国家铁路局". nra.gov.cn. Retrieved 5 December 2017. ^ "重磅：工期都是5年，宜攀、乐西高速公路集中开工建设！". sohu.com. Retrieved 31 March 2019. ^ "项目群 / 棋盘洲桥长江公路大桥_我的网站". hbwxqgs.com. Retrieved 6 December 2017. ^ "好快！万州新田长江大桥建成这样了！_施工". sohu.com. Retrieved 31 March 2019. ^ "重庆长寿长江二桥工程举行开工典礼 - 重庆市建筑科学研究院活动专题网". cqsjky.com. Retrieved 6 December 2017. ^ "云房网". h0766.net. Retrieved 6 December 2017. ^ "怀来官厅水库大桥猫道承重索安装完毕". sohu.com. 2 November 2017. Retrieved 6 December 2017.